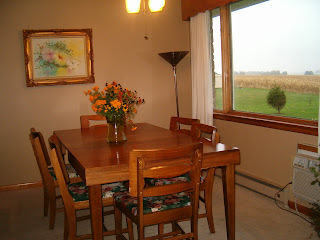 Redo Redux: Revisiting Past Projects: The Dining Room Gets Smaller with Each New Coat of Paint! The Dining Room Gets Smaller with Each New Coat of Paint! I mentioned, in an earlier post, that our dining room has been through a lot of changes. So I decided to chronicle some of those changes this morning. We bought this house in late 2004. The color of the wall . . . . changed and then changed again! The fan light will be gone in subsequent shots; watch for it! Ah! The ceiling fan disappeared! This was a recent addition: track lighting with pendant lights. Why, there's Ed, my dear daddio. ,making our dining room especially good! Love you, Dad. I quit! I have had a lot of fun this morning, reliving the passage of time through our dining room.